Randy's Ready to lead Hammerheads in Jupiter! 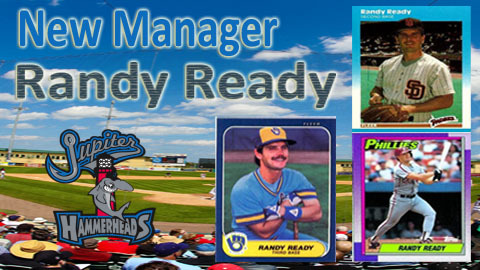 JUPITER, FL - The Jupiter Hammerheads are excited to welcome Manager Randy Ready for the 2016 Season! Ready heads the Hammerheads' coaching staff including Pitching Coach Jeremy Powell, Hitting Coach Frank Moore and Trainer Ben Cates. Randy Ready spent much of 2015 with the Dallas Tigers Select 16U team which earned a Perfect Game World Series Championship. In 2013, Ready was manager of Triple-A Gwinnett in the Braves Organization. Prior to that, he was Minor League Hitting Coordinator for the Texas Rangers in 2012 and was the Major League hitting coach for the San Diego Padres for three seasons (2009-11). He began his coaching career with Detroit as Manager of Short-A Affiliate Oneonta from 2002-03. He also served as Manager in the Padres organization with Triple-A Portland (2008-09). Double-A San Antonio ('07) and Single-A Fort Wayne ('04-06). He reached the postseason in each of his first six years overall as Manager, including a Texas League Championship in 2007. The former sixth-round draft pick in 1980 by Milwaukee appeared in 777 MLB games over parts of 13 seasons with the Brewers, Padres, Phillies, Athletics and Expos. Ready and his wife, Tracy, reside in Dallas, Texas, and six sons: Andrew, Collin, Jarrod, Max, Nic and Mark. Jeremy Powell begins his first season as the Hammerheads Pitching Coach, marking his fifth season with the Marlins. He spent the previous two campaigns as pitching coach for Greensboro and the prior two years (2012-13) as the pitching coach for the GCL Marlins. Frank Moore returns to Jupiter as Hitting Coach for the Hammerheads, a position he also held in 2011, following a one-year stint as the Marlins Outfield and Base running coordinator in 2015. Previously, he spent three years as Greensboro's hitting coach (2012-15), served as the hitting coach for Jupiter in 2011 and Jamestown in 2009-10. Before being named Jamestown's hitting coach, he played with the Albuquerque Isotopes in 2007. Ben Cates begins his second season as Athletic Trainer for Jupiter, following three seasons with Greensboro in the same role. He spent the 2012 season as the athletic trainer for Jamestown. Prior to that, he was an intern under the Athletic Training and Rehabilitation Coordinator, Gene Basham. Other staff additions include; Strength and Conditioning Coach Ian Kadish and Video Assistant Jimmy Leo. Joe Coleman has been promoted to Senior Advisor of Pitching Development. About Jupiter Stadium, LTD: Opened in 1998, this $28 million complex/stadium is specially designed to house two Major League and two Minor League Baseball Teams. The stadium is home to the Miami Marlins and the St. Louis Cardinals for Spring Training. The Florida State League's Jupiter Hammerheads (Class-A Advanced Affiliate of the Miami Marlins) and Palm Beach Cardinals (Class-A Advanced Affiliate of the St. Louis Cardinals) make their home at Roger Dean Stadium from April through September. This year round facility can accommodate the smallest birthday party to the largest corporate outing, while never forgetting that each and every fan is our most important product.